Planting Cabbages: Building the Fire: Is A Wood-Oven Like a Sea Turtle? 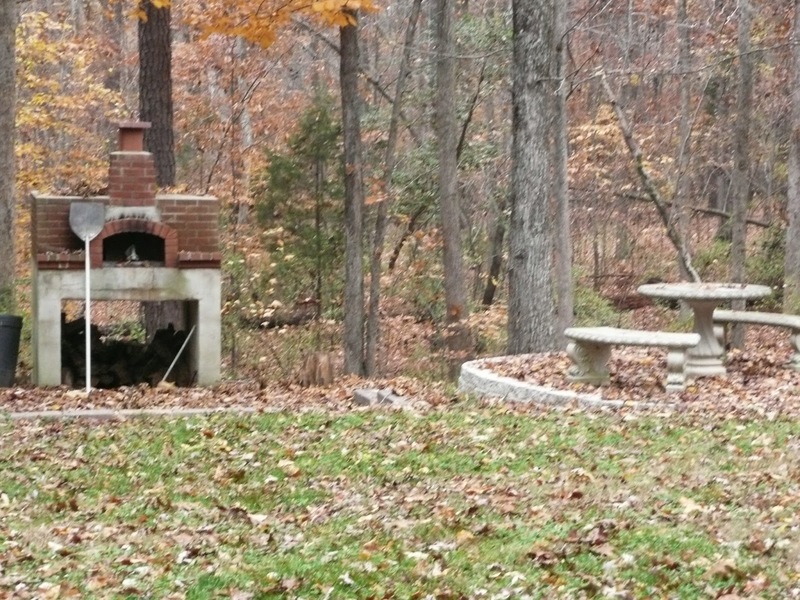 Building the Fire: Is A Wood-Oven Like a Sea Turtle? There's really nothing quite like feeding a fire and feeding people, food that you made together in the fire. It's primitive and basic. And feeds your hunger for tellingstories. And leaves your hair smelling fabulous! With C'est si Bon! 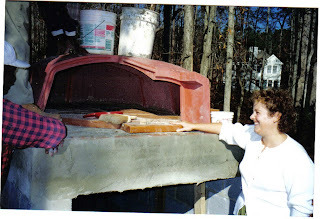 's wood-fired oven class tomorrow, May 8th, I hope to share this ancient story as we slide our pizzas into its inferno. I'll post some photos and our recipe then! "It arrives in two weeks by sea container from Livorno into the port at Wilmington." Paolo Migno, our Tuscan connection reported by e-mail. Even though his words weren’t spoken, I could still hear his booming Italian accent. "How much does it weigh?" Never mind the nuances, my husband, Rich, wanted the details. "A lot." I tried to think of a number that sounded big, but not frightening. None came to mind. And so it was on a steamy Friday morning in June of 1998 that Rich and I borrowed our kitchen re-builder, Ramon Garcia’s, great white dump truck to take us to Crabtree Valley Mall in Raleigh to search the warehouse which was supposedly holding our Tuscan oven hostage. Bouncing along route 40 outside Chapel Hill I wondered whether Ramon would trade his funky dump truck for my mother's Toyota Corolla. "Everyone sure gets out of your way." I said as we narrowly missed a U-Haul headed to Georgia. If I had filled our orange water cooler, bungied it in the snug bed of the truck, and hijacked a few orange cones from a construction site we might not have appeared so obviously inexperienced. At the Crabtree Valley Mall security office we paged our oven contact, Charles Foster. He alone knew where our oven was hiding. We followed him in his forklift around the parking lot, our dump truck lurching every once in a while at the tight curves, his forklift seemed so little and so yellow I feared we might not be enough in control and roll over him, crushing any hope of ever finding our oven. He stopped at Kanki's, a Japanese restaurant on the Other Side of the mall. Paolo had said the "sea container" he sent from Livorno also contained marble slabs, and the rubble of reconstruction and the sushi buffet on the way out made me nostalgic for the days of our own kitchen construction. We nearly mistook a most beguiling silvery wrapped hood as our oven, incognito. Once again we follow the yellow forklift. In front of the warehouse, Charles unhooked his belted security two-way radio. I was thankful, as his pants were about to fall off from its weight. We squeezed through the warehouse, piled sky high from the door to the back with styrofoam wrapped and unwrapped marble slabs in pink, gray, and black. "No, tavolo means table, not oven," I reminded Rich. Al forno? Al forno? Where-forno- art-thou? "There it is!" I screeched, hemmed in on all sides by white marble. It looked like an orange plastic cryovac'd bee-hive. Will it ever be safely in my arms? "We'll have it out in no time." Charles strapped his radio belt back on and made a call for help. “Its only about six loads of stuff in the way.” I couldn't bear to watch, so I stepped outside for a slug of ice water. And sit in the bed of the dump truck. And slip my sandals on and off. Finally Rich gave the thumbs up. Time to stop the flow of traffic outside the warehouse. As soon as he backed up Ramon’s truck and Charles loaded it, the truck suspension sank under the weight. Would we be pushing the truck and the oven down route 40? Nothing seemed broken. I swear the truck burped as we pulled out on 70, passed the Angus Barn, regretting that we couldn't stop immediately and celebrate with a charred side or two of beef. Rich threw the truck into fifth or six, or whatever gear it takes to get Italian ovens home. I wrapped my arm around the back of his seat. He drank down a Perrier, the bottle sweating profusely, and I twisted open a Dr. Pepper. The inside of the cap said play again and it felt like good news to me. When we parked the truck in our cul de sac, the clay oven seemed to welcome the blazing midday sun, getting ready for fires of its own. Rich retreated inside our house to collapse. Erick, Jaryd and I went out in search of the proper dinner ingredients to christen the evening and the oven with Ramon and Kathy. We carried home five lobsters, four dozen clams, and a beef tenderloin locked inside a box labeled Cajun Seasoning. Sun retreated, beef marinated, lobsters claws unlocked, Rich rested. When Ramon and Kathleen arrived, they laughed and said we could keep the tow truck and we took our wine glasses outside. All was silent when we broke the great orange plastic shell and finally saw the oven. Curved slabs of clay, rested, and nested inside each other. Piece by piece we lowered the oven to the ground near our newly planted white rose. We assembled the oven on the ground. It seemed fitting that it resembled a giant sea turtle. I imagined the turtle floating across the sea, journeying all the from the port at Livorno. And with that we broke a bottle of rose wine from Gascony, which was just as hard to find as our oven, over the clay, and as the wine soaked into the terracotta, I knew, and I whispered the rhyme. I ordered a replica versace shoe here.cheap replica versace shoes When I received the shoes, it surprised me a lot. The shoes are perfect and the quality is exactly the same. A dazzling masonry. buy versace 2018 new copy I introduced this website to my friends, and my friends liked it very much.